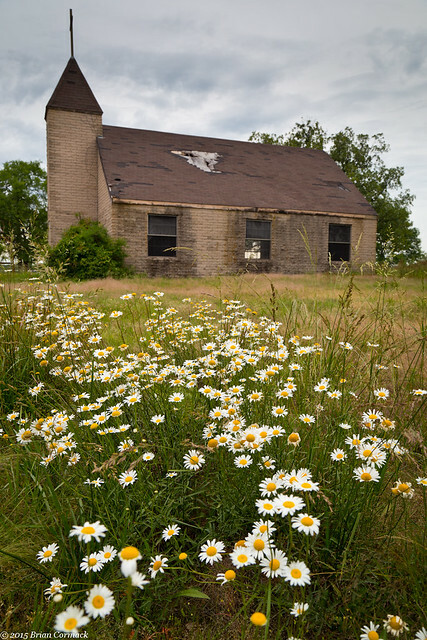 A really good photographer that I follow (Linda Henderson) posted a few photos of an old church, which of course made me want to go and find it. I've been trying to track down a bunch of old churches around the state, with the thought of eventually taking some star trail pictures there. 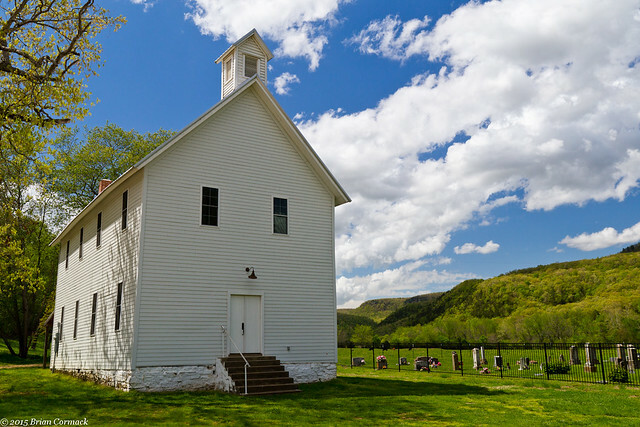 So last weekend I headed out to the old church, which is located near the small town of Mt. Vernon. The day had been clear, and the weather predicted it would be clear for the rest of the night. 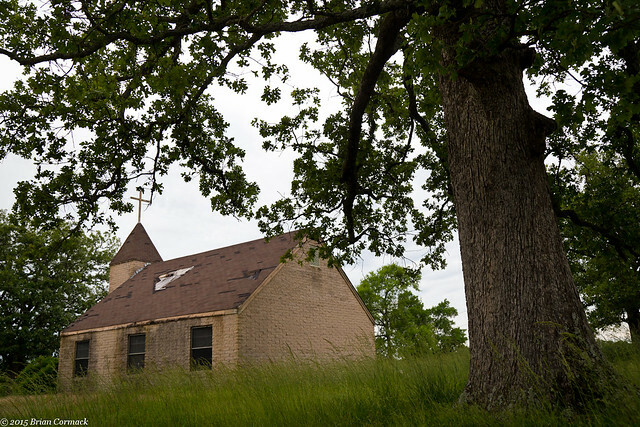 So I rushed home after work and got the camera gear and then sped off towards the church. But of course, some storm clouds crept in. The day would turn out to be better for waterfalls and not stars. Oh well. But it is a very photogenic little church, no matter what the weather is like. Some wildflowers were growing up next to the church. I took this as a small storm was moving by, it started raining a few minutes later. 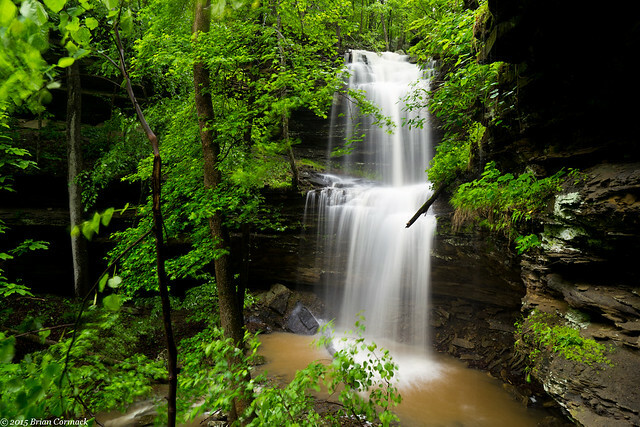 It seems like it’s rained just about every single day during the month of May, which means that waterfalls have definitely been up and running lately. 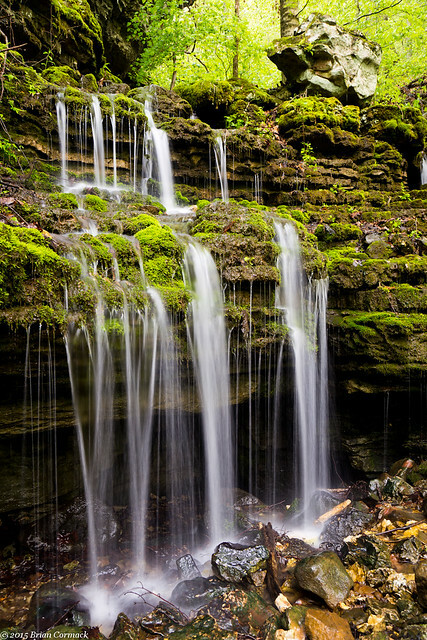 So a few weeks back, Zack and I headed up to the Ozarks to try hit a few waterfalls before the dry summer doldrums set in. 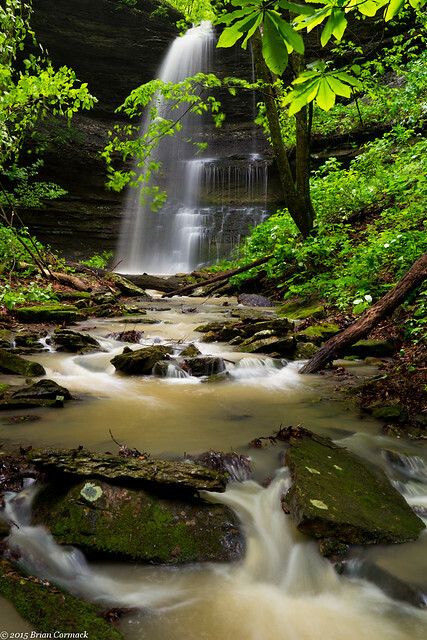 The first stop was a small waterfall that sits right along a dirt road near the town of Dover. But even with all the recent rains, the waterfalls there weren’t really running all that well. So we continued on, heading back towards Dover. Along the way we stopped and walked along this small creek, which had a nice little cascade on it. You can’t see the creek from the road, so it doesn’t seem like this spot ever sees many visitors. We were there until it was nearly too dark to take pictures, and headed back to the car. 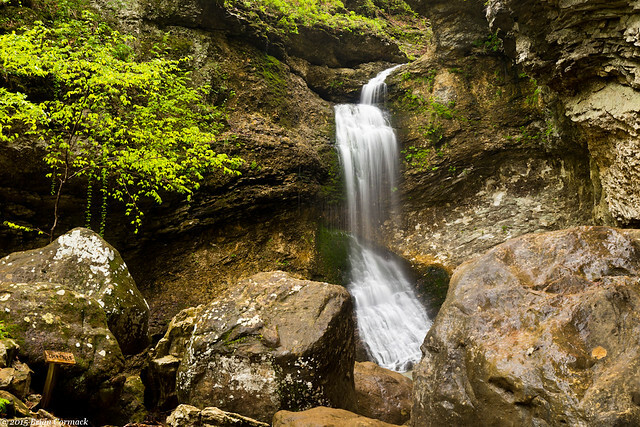 The next stop was Acord Hollow Falls, which is near the small town of Oark. I soon felt a pang of regret for driving on this trip, when we decided to try to take a shortcut. We left the smoothness of the pavement and hit a bumpy dirt road, which would prove to be just a little too much for my poor little car. Rocks would menacingly scratch and scrape the bottom of the car, and mysterious and ominous noises erupted from under the floorboard. Eventually we reached a large mud hole, which seemed like it would swallow up the car, and had to turn around. So the bottom of the car got to pay a return visit to all of the sharp rocks that we drove over before. The other way to get to the falls follows another dirt road, but this one is mostly in great shape (it was like driving the Autobahn compared to the rock and crater infested road we just tried to navigate). But as we got close to the start of the hike, we reached another large mud hole and decided to not attempt a crossing. Since we were fairly close to the start, we decided to park at a safe spot on the road and camp in the car for the night. It was a good thing we weren’t trying to camp in a tent that night. A huge storm moved in around 3 AM, which dropped a lot of lightning and a lot of rain. Tons of rain, actually. The storm dumped somewhere between two and three inches of rain in the span of a few hours. The woods were drenched, and there was water everywhere. My car actually looked spotless after the rain washed away the cake of mud that had accumulated during the drive in. The storm had moved out, so we decided to begin the hike into Acord Hollow. 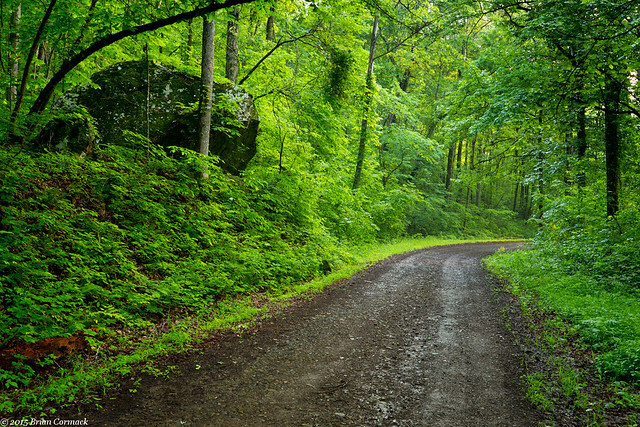 The trail starts out following the Ozark Highlands Trail for a bit, but then veers off into the woods. The first part of the hike was deceivably easy, just a nice stroll through the woods. 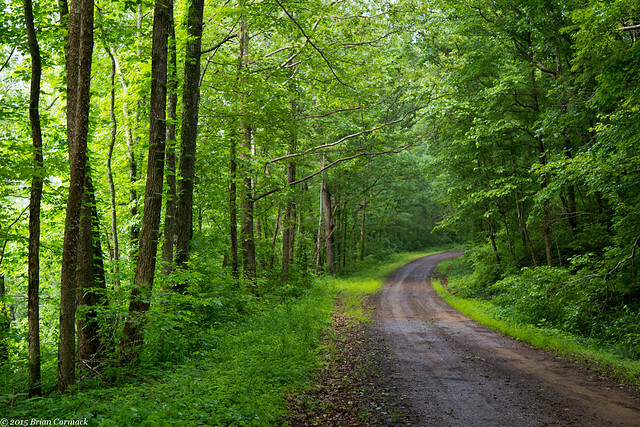 But soon enough it turned into a difficult bushwhack on steep hills that were slick, muddy and coated with poison ivy. 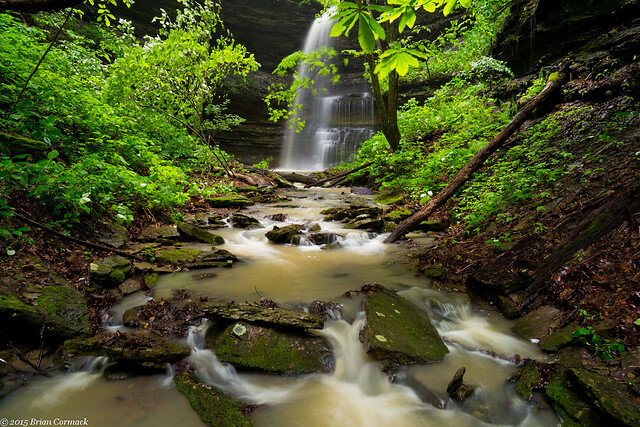 Eventually we made our way to Acord Hollow Falls, which was swollen and a little muddy after the storm. The falls are 66 feet tall, and this is the view of the upper tier. The bluff was thick with vegetation (not all of which was poison ivy!). We found a spot to drop below the bluff, getting this view. The spray from the falls was flowing out like wind from the base of the falls. And the view from the bottom of the falls, from under the overhanging bluff. We took a lot of pictures there, stopping for one last shot at this spot along the creek. This was actually taken with the tripod sitting in the middle of the muddy creek. We then headed to another nearby waterfall, which was located in a small horseshoe shaped canyon. 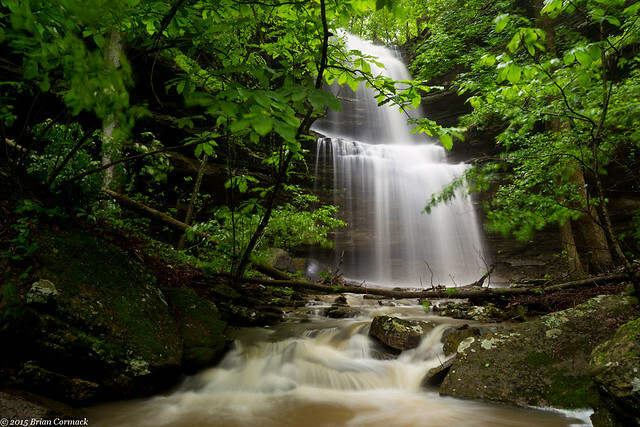 The falls are actually about 40 feet tall, and are surrounded by a few umbrella magnolia trees. 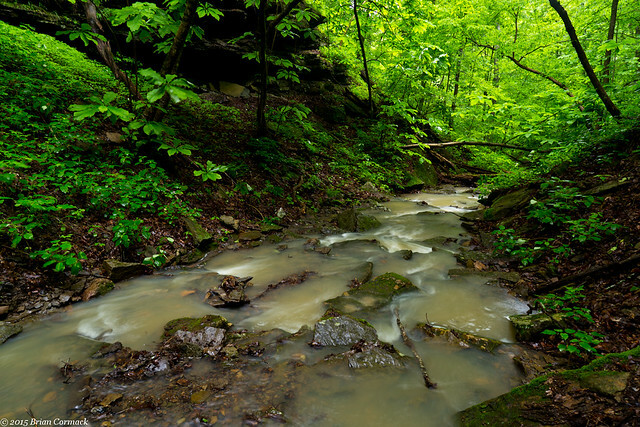 And a view of the creek, as the muddy waters make their way down the hollow. And from there we headed up the steep hill. The bushwhack to the falls is short (only a few miles), but steep. I was happy, and a little sore, when we finally made it back to the car. I admit to not being an expert on a lot of things regarding photography (what does focus mean?! ), but I've been seriously trying to understand how star trail photography works. 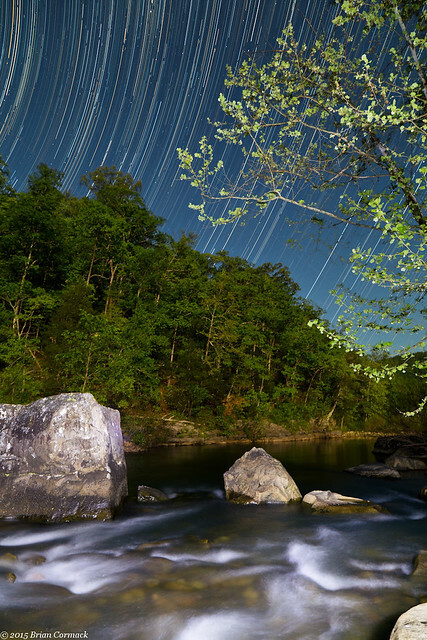 So a few weeks ago I had a chance to get out and try to take a few pictures at night, and decided to try doing star trails over a waterfall. The weather was perfect, nice and clear with nary a cloud in the sky. It was also the full moon, which I hoped would be helpful (or not mess things up too much). 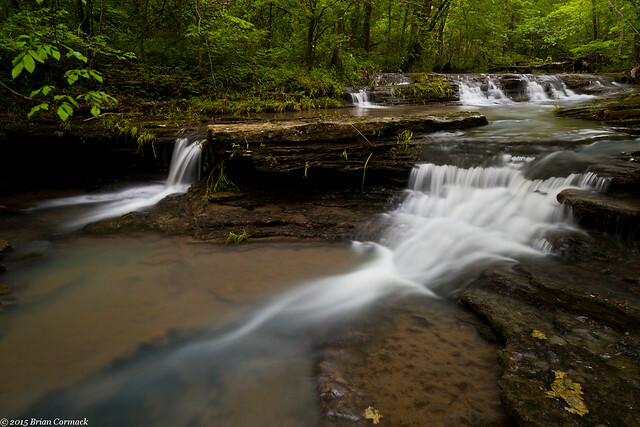 So I packed up the camera and drove back up into the Ozarks, and headed down the familiar dirt road to Falling Water Creek and Richland Creek. 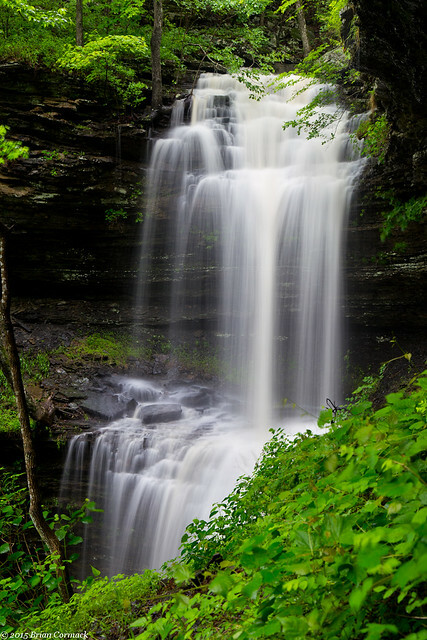 My original plan was to try to do star trails above Falling Water Falls and Six Finger Falls. But I don't think Falling Water would have actually worked out because the moon would have been in the sky right above the falls. But it didn't matter anyways. It was about 10:00 at night when I drove by Falling Water Falls and was surprised to see the small parking area there packed with cars. People were actually camping right on top of the waterfall, and spread out in the woods across the creek. Tents were set up right on the rocks by the falls, which is dangerous and a real jerk move to make. If the Forest Service closed part of the Richland Creek campground because of flash flood risks, I doubt they would be happy with people camping 2 feet away from a creek. Also it's incredibly inconsiderate since it prevents anyone else from enjoying the waterfall while you camp there like you own the place. So instead I drove down to Six Finger Falls, which luckily was free of any wayward campers. I set the camera up and let it take pictures for about two hours. 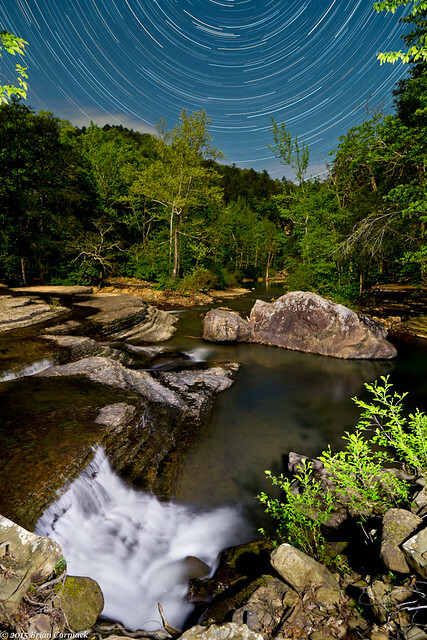 The foreground was lit by a flashlight, while the creek in the background is lit by moonlight. I wish there was more water in the creek, but it was a bit low that day. This was taken a few days before the monsoon season hit here, where it's been raining pretty much every day for three weeks straight. I drove down to the Richland Creek campground, which surprisingly only had a few people there and had many open campsites (guess everyone was already camping at Falling Water). I set up the camera right by the water to try to get some shots of the stars above the creek. The rocks and tree in the foreground are lit by the flashlight, while everything else is from the moon. I was there for about an hour and a half taking pictures. I decided to stop when the moon dropped below the trees and the woods descended into complete darkness. I decided to call it a night and head towards home (and bed), thankful that there weren't any snakes out trying to enjoy the stars that night too. We began hiking the trail into Lost Valley as the sky ominously darkened. While the day had been sunny, a few storms were predicted to pass through the area that afternoon. But it was worth the risk of getting rained on, the hike into Lost Valley is one of the prettiest in the state. The trail is short, but it is compact. 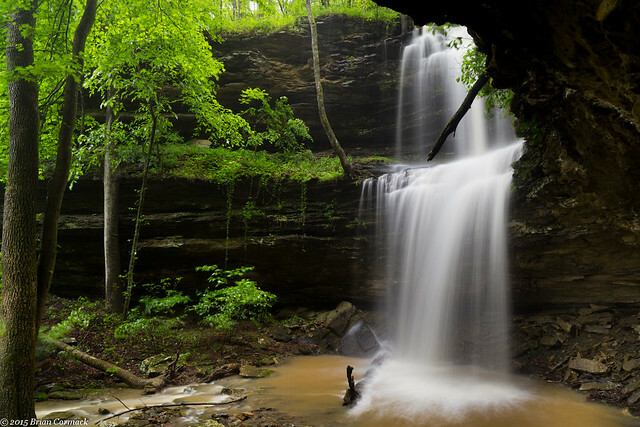 It passes by several waterfalls and caves (and even a waterfall inside a cave). 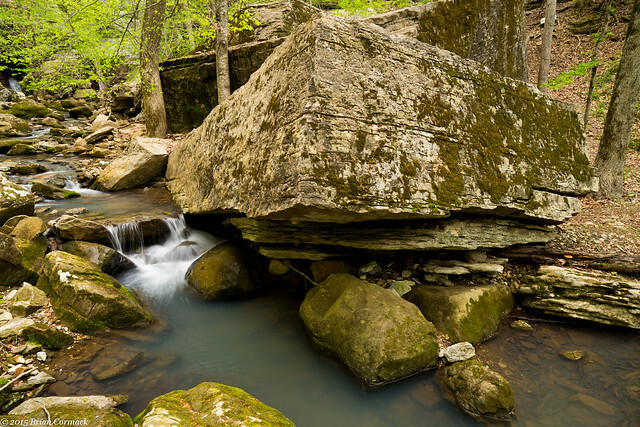 For the most part, the trail runs alongside Clark Creek as it passes through the collapsed remains of an old cave system. Lost Valley was once a cave, but the roof collapsed many eons ago. What remains is this small valley and one of the most popular trails in the Buffalo National River. 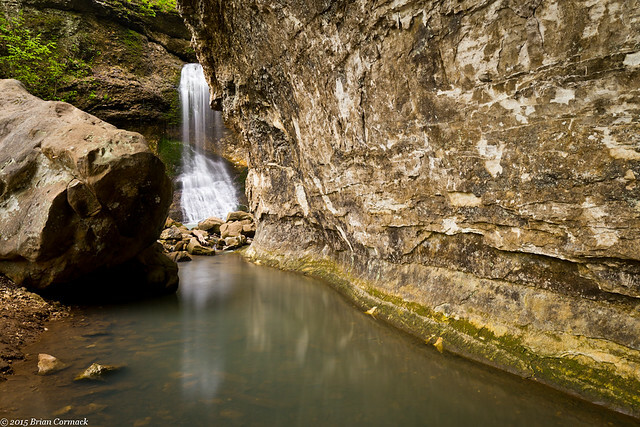 A small waterfall drops out of the Natural Bridge, which was actually once the mouth of the collapsed cave. 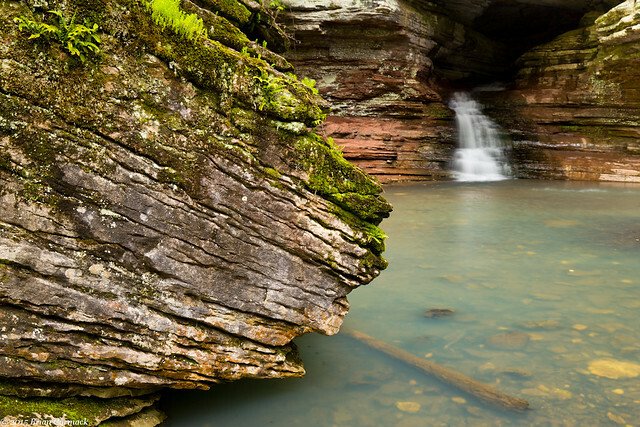 The falls drop into a small pool that is filled with turquoise water and surrounded by limestone boulders and bluffs. Thunder was echoing across the valley as we hiked uphill towards Eden Falls. When we reached the waterfall, it started pouring down rain. But we just started to take pictures while standing under the protected overhang of Cob Cave. The rain and thunder didn't last too long, and quickly moved past. A few minutes later, the sun even came out again. And one last shot from the trip, of a small waterfall along the trail. The water drops over a small bluff, before actually running back down under the bluff and then disappearing in to the rocks and going underground. After moving into the new house, I decided to take a quick break from carrying and unloading boxes and try to find some free-time to take a few pictures. The weather had been predicted to be rainy all weekend, which isn’t good for moving but great for pictures. But instead of dumping inches of rain, it was mostly sunny all weekend. 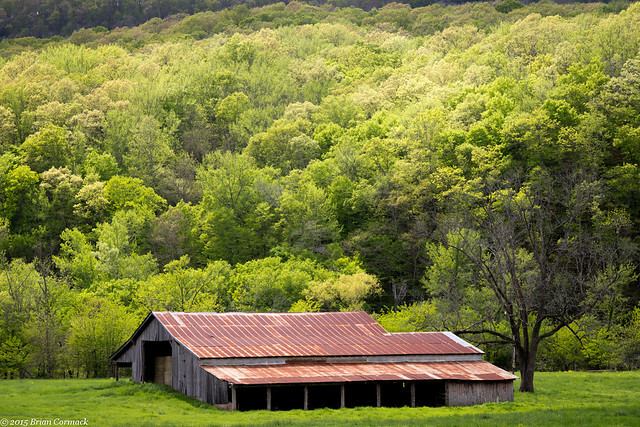 I headed up to the hills anyways, as Spring was beginning to settle in over the Ozarks. As I started heading north from Russellville, a strange greenish haze was floating over the hills. Was it some sort of fog that was weirdly reflecting the sun? Nope, it was pollen. Clouds and clouds of pollen. The trees were exploding with pollen, which was drifting around like smoke. I met my Aunt in Boxley Valley, and we then set out to take a few pictures. 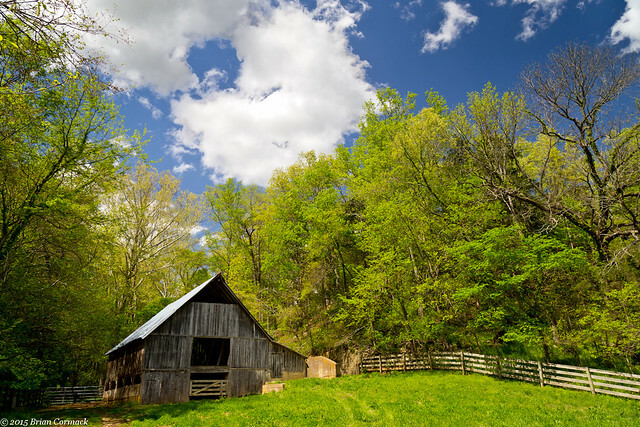 Boxley Valley is one of the prettiest spots along the Buffalo River, with numerous old barns and churches located right along the river. Most of the buildings are historic and date back to the 1800s. This is the old Beechwoods Church, which was built in 1918. The church and cemetery occupy a small field, overlooking the distant fields and forests of the valley. 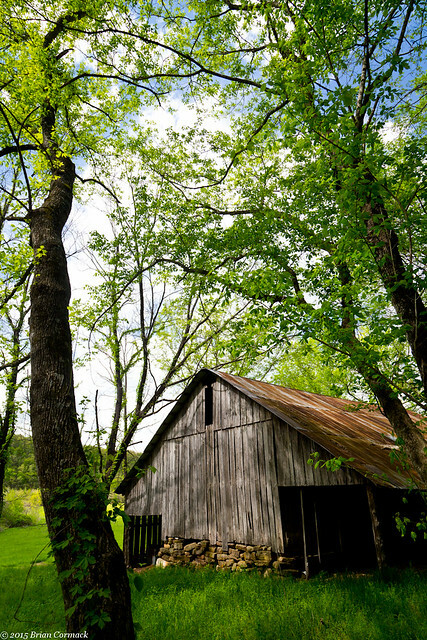 Boxley Valley is filled with several old homes that once belonged to the original settlers of this area. The old Villines cabin, located at the far end of the valley, sits above the river. 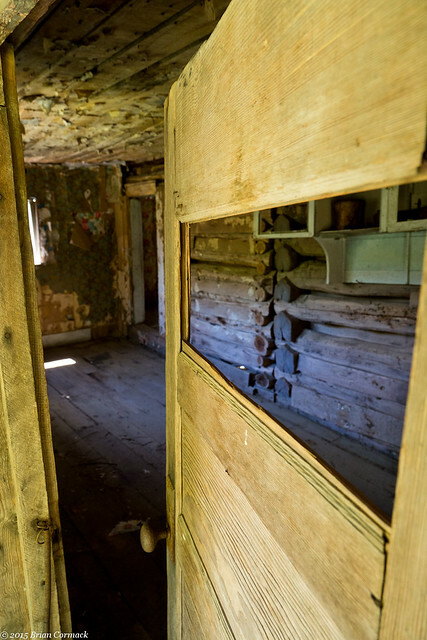 The cabin was probably built sometime in the 1850s and is part of a homestead that also has a corn-crib, a barn, a chicken coop and an outhouse. 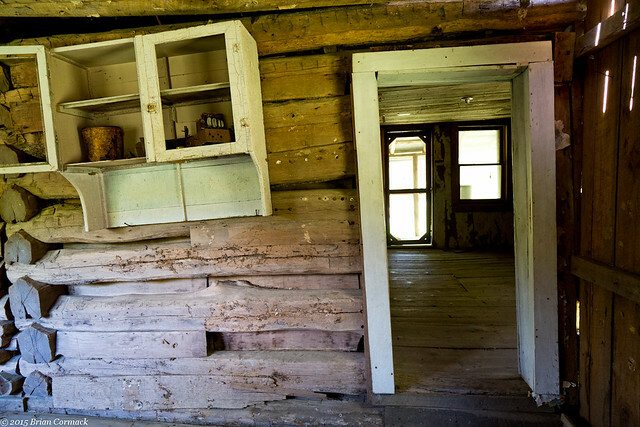 The inside of the cabin still contains a few old pieces of furniture from its last inhabitants. There is still some sheets of newspaper on the wall, which was used as insulation back in the olden days. 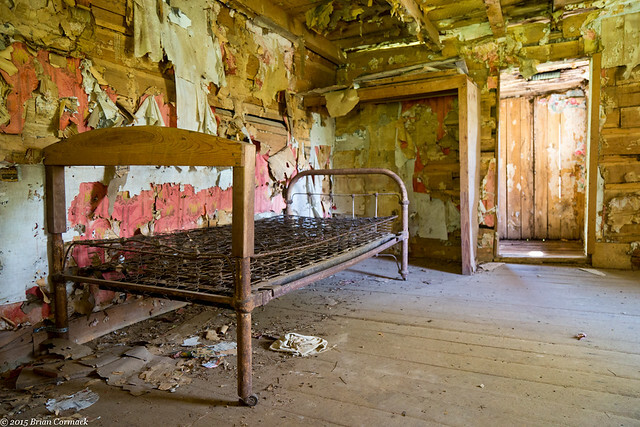 The doors to the cabin were open, but a few posted signs were there warning against entry. So this was taken with the camera looking through the doorway. The inside is definitely leaning to one side, which may be why the Park Service doesn't want anyone going inside. 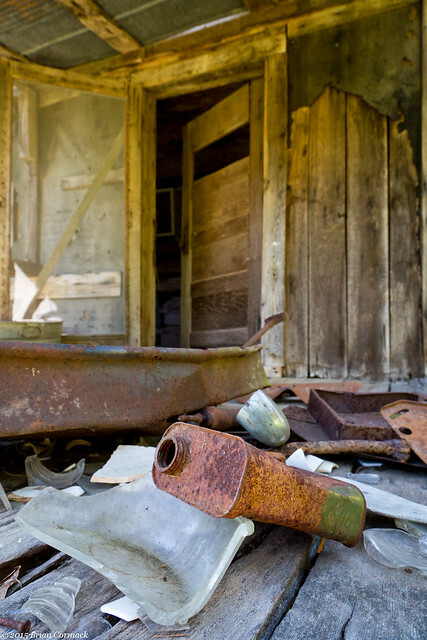 And some of the collection of bottles and containers sitting on the back porch, which may have been sitting here rusting for the past few decades. Just down the road is this old barn, built in 1915. Sometimes you can see elk here, they will occasionally hang out in the field behind the barn. 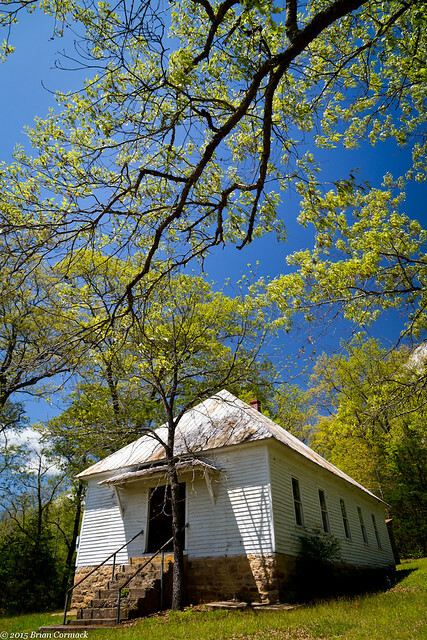 Perhaps the centerpiece of the valley is the old Boxley Baptist Church. 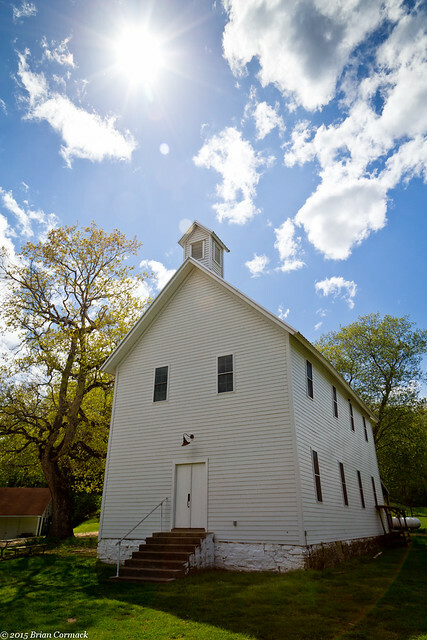 The church was built in 1899, and is still used as a community center. Boxley Valley probably has the densest collection of old buildings in the state. This old barn was built sometime around 1920. Some storm clouds were beginning to move through, and would occasionally cast the hills in shadow. 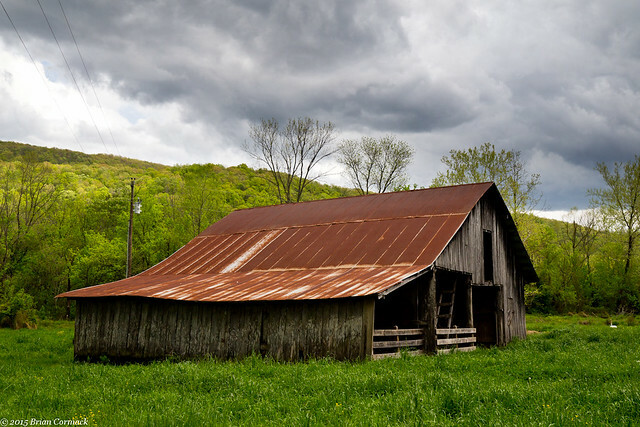 Here the sun poked through, shining onto this old barn and Cave Mountain in the background. Cave Mountain saw a few Civil War skirmishes, with Union troops attacking a small Confederate operation that was mining bat guano from Cave Mountain's namesake cave. And one last stop, at an old barn that sits near the Mill pond. I didn't notice this until tonight, but in this picture you can see on of the valley's newest residents. To the right of the old barn is one of the trumpeter swans that was introduced here a few years ago.